Super simple vegetable salad. 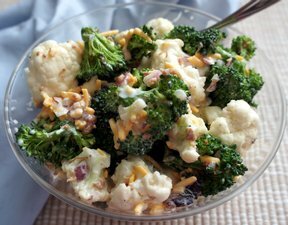 The perfect combination of vegetables for great flavor and crunch. 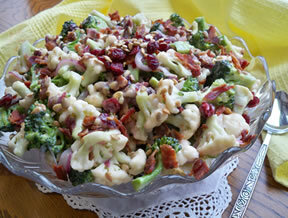 The sweetened mayo is just right as the finishing touch to this salad. 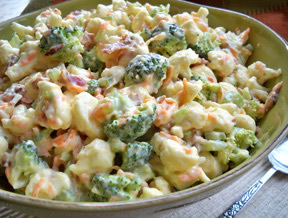 Toss together vegetables and refrigerate. Make dressing and refrigerate overnight. 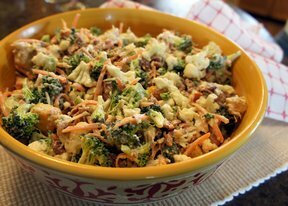 Next day mix the vegetables and dressing together; sprinkle with fresh Parmesan. Optional red & green pepper, green onion, or bacon. Note: The finer the vegetables are cut the better the taste. "Great salad! Looks good and tastes good. It would make a nice side dish for Thanksgiving dinner."